A framework to define an or selection filter. This selects one or another type of sensitive entity. 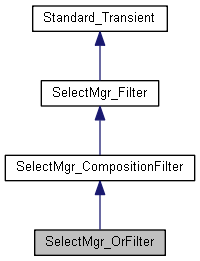 Constructs an empty or selection filter. Indicates that the selected Interactive Object passes the filter. The owner, anObj, can be either direct or user. A direct owner is the corresponding construction element, whereas a user is the compound shape of which the entity forms a part. When an object is detected by the mouse - in AIS, this is done through a context selector - its owner is passed to the filter as an argument. If the object returns Standard_True, it is kept; if not, it is rejected. If you are creating a filter class inheriting this framework, and the daughter class is to be used in an AIS local context, you will need to implement the virtual function ActsOn. Disable selection of specified objects.